Camouflage (noun) is defined as concealment that obscures the physical appearance. In the natural world, camouflage (verb) is essentially the process by which an organism blends with the elements in its habitat, conceals itself, alters its appearance or for that matter resembles an object in its environment. Camouflage has, over several millennia, evolved in response to various environmental conditions and survival pressures. According to Darwin’s theory of natural selection, camouflage was one of the features that evolved to help both prey and predators survive better and therefore, perpetuate. Different species use colour, texture and pattern to blend in with their environment. The kind of camouflage depends on different factors, including the physiology and behaviour of the animal itself and who it is hiding from, its surroundings, background and environment. Some animals may change colour helping them blend with their surroundings; the most popular example being the chameleon. This type of camouflage in which it is difficult to see the animal is called crypsis. Some may disguise themselves in such a way that they are misrepresented, like the grasshopper that has a striking resemblance to a leaf. This is known as mimesis. There are many others kinds of camouflage in nature. If we observe closely, we will be able to discern and appreciate the several variations in the basic concept of camouflage. Blue Oakleaf, Goa: A classic example of mimesis, this butterfly is a hard one to spot when resting. 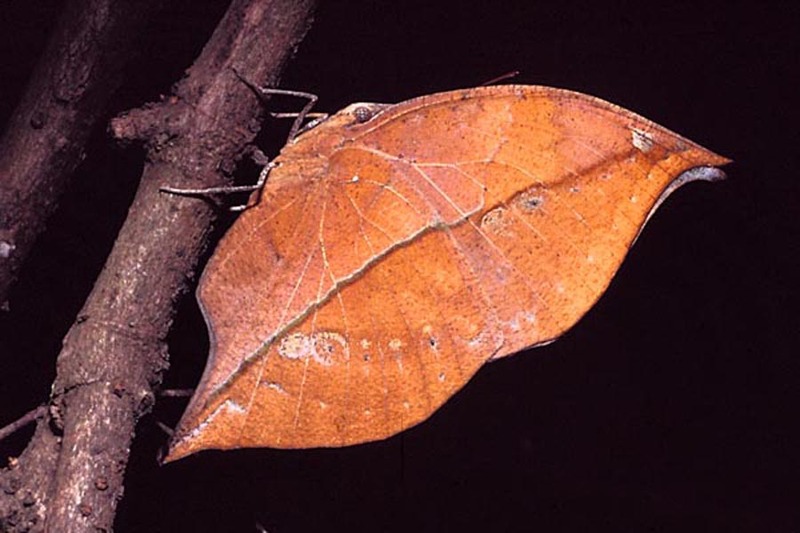 The undersides of this butterfly also have marks that look like fungal infestation enhancing the resemblance to a dead leaf. Grasshopper, Goa: The genus Phyllochoreia to which this grasshopper belongs is endemic to Western Ghats and Sri Lanka. It bears a strong resemblance to the leaves. Moth, Bangalore: resembling a dead leaf. Praying Mantis Gongylus sp., Nagarahole: The body has a close resemblance to a damaged dry leaf.